This is the first of several posts showing how I make cookies with characters from Disney's Frozen. These were party favours of Olaf's face. 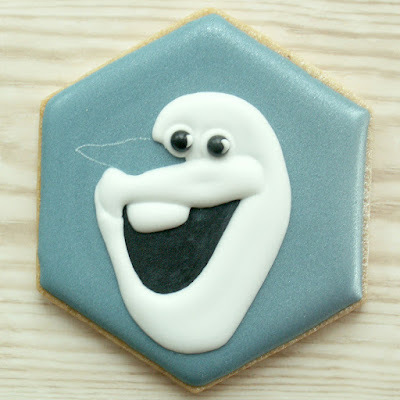 The second part features Princesses Anna and Elsa cookies and this later post is a tutorial for creating royal icing eyes. To start with I flooded the cookies with a cool blue colour, and while still wet, sprayed with silver from a low angle, so that the sheen was off set. I've been using hexagons for these sorts of cookies a lot as I love the shape and how they fit together, and straight sided shapes are a lot easier to outline and flood than circles. Cookie bases flooded and dried until hard. White and orange 20 second royal icing. Black, brown and blue food colour gel or paste. Essence or alcohol to dilute the food colour. In addition to the usual piping equipment: a scribe tool or toothpick (or my personal favouite, a bradawl!) and a fine paintbrush kept for food use only. 1. 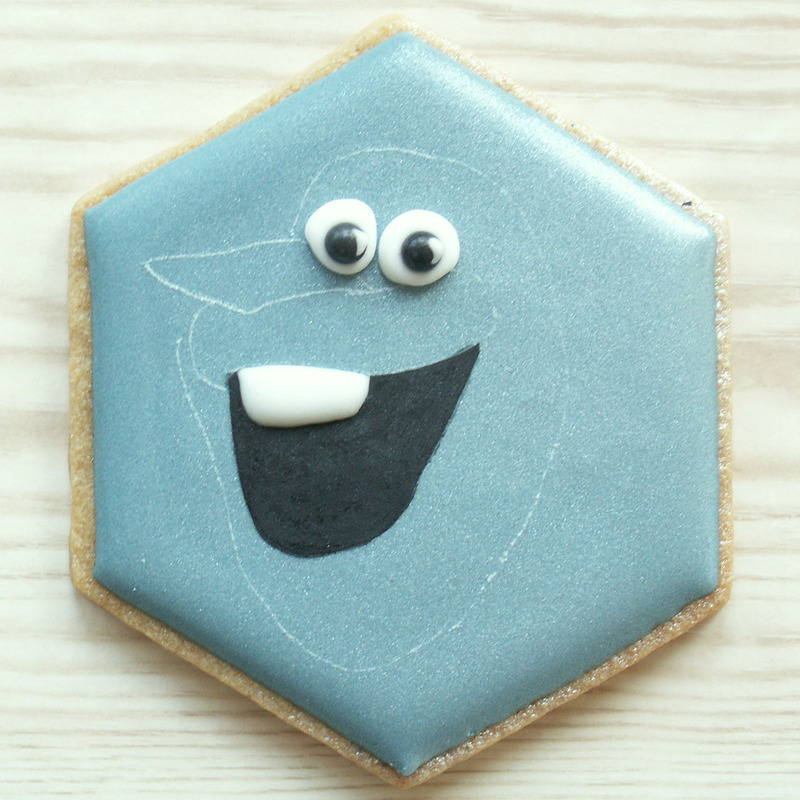 Using whichever is your favourite method to transfer images onto cookies, scribe or draw the image onto the cookie. I used the Camera Lucida ipad app here (I've since updated to a Pico projector, but the app is a great way to get started very cheaply, if you already have a smart phone or ipad). Another useful method, if you don't have a Kopykake or app, is to trace the image, then use pin pricks through the tracing to mark out the shape on the cookie. I used to use this a lot. 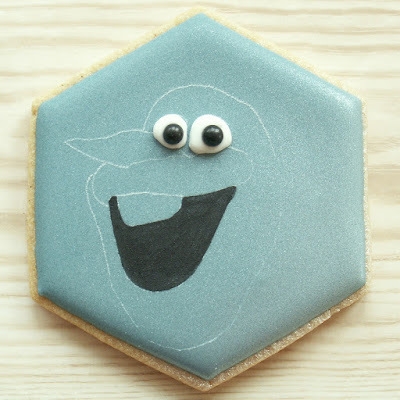 For complex images, you can end up with an awful lot of pinholes on the cookie, it can get confusing - like join the dots without any numbers to help you! I've never tried Sweetambs' tissue paper method, but it looks more direct and effective than my old pinhole method. 2. Using black food colouring and vanilla essence to make quite a thick paint, paint the dark area of the mouth. This takes quite a time to dry, but covers the area well without having to mix and flood black royal icing. 3. Pipe white icing blobs for the eyes, and use a scribe tool to tease out the shapes to fit the image. These had to be a bit lopsided because of the angle of his face and nose. Add black sugar pearls for the pupils. 4. Next pipe the tooth. Generally, it's a good idea to work out which areas are meant to be 'behind' others, and work from 'back to front', as each successive section will slightly overlap the previous ones, unless you're very careful. I usually think the process through and create a 'paint by numbers' plot in my mind before starting. 5. Flood the head and face with white, using the scribe tool to tease the icing in between the eyes and into the sharper corners. 7. Pipe the carrot nose and tease into shape with the scribe tool. 8. Allow all the areas to dry, then add painted details: using a little brown food colouring, paint shading around the carrot. A light blue between the white eyeballs and white head adds a little depth and definition otherwise they can get a bit lost. Using the same thick black food colouring paint, paint in the sticks in his head, the 'eyeliner' and the eyebrows. I used the same method, and same white and orange icing for this full body Olaf, but I piped the arms in the orange, then painted them brown afterwards.I also added blue shading down the side of his body. Find Part 2, featuring Anna and Elsa here! Why not check out my Camera Lucida ipad app and Moshi Monster character tutorial! This is awesome!!! Thank you so much!!! Lucy, how did you get that color of blue? I don't have a 'system' for creating colours as I do it most by eye, often use up what leftover icing I've got and tweaking it, so any one colour could have several different food colour gels contributing to it. I use sugarflair gels, and the two blues I have currently are ice blue (a little bit greenish) and navy, which is most likely what I used here, as it has a darker blackish tone. You're so incredibly talented. Thank you for sharing your talent with us! 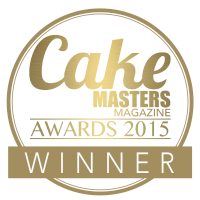 My pleasure - thank you! 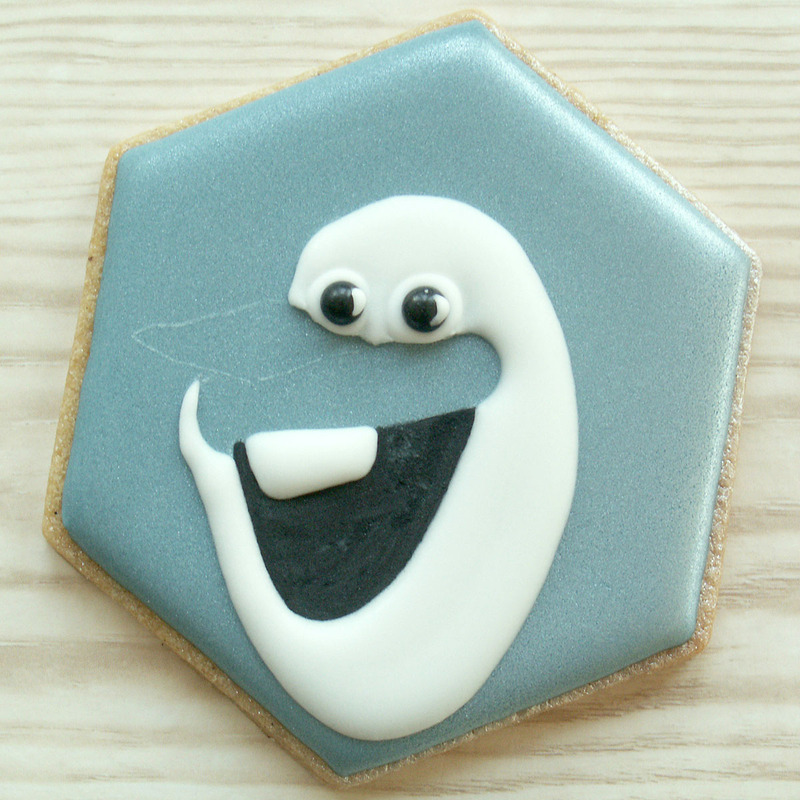 I just love Olaf and you made it look so simple to create him (but I know better). Thanks for the tutorial!! Lucy, what is that thing called that you have on your pastry bag to keep it closed - it doesn't look like any pastry clip that I have ever seen. It looks tubular-shaped with a hole in it. Hi Sherrie. It's an 'Oxo Good Grips' bag cinch or clip. It's slightly springy and you just squeeze to open the centre, put it around the bag, and release pressure to have it spring tight onto the bag, holding it closed. Just a slight pressure and you can slide it down as the bag empties. You can get them on Amazon, not cheap, but so easy and quick to use I invested in a whole bunch of them! Hi Lucy, I would like to know the size of the eyes you make for character cookies like Elsa and Anna. Thanks. Hi. They vary as they're handmade, but they tend to be around 6 or 7mm in length. I tend to pick a reasonably matching pair before I start then match up the face size around them. What did you use on top to give it shine? 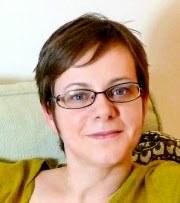 Hi Tessa. Once I flooded the cookie and while it was still wet I sprayed it with pearl lustre (actually Dr Oetker Silver, which isn't really silver, more pearl white). It has a smoother sheen and is less likely to rub off when it dries that way. 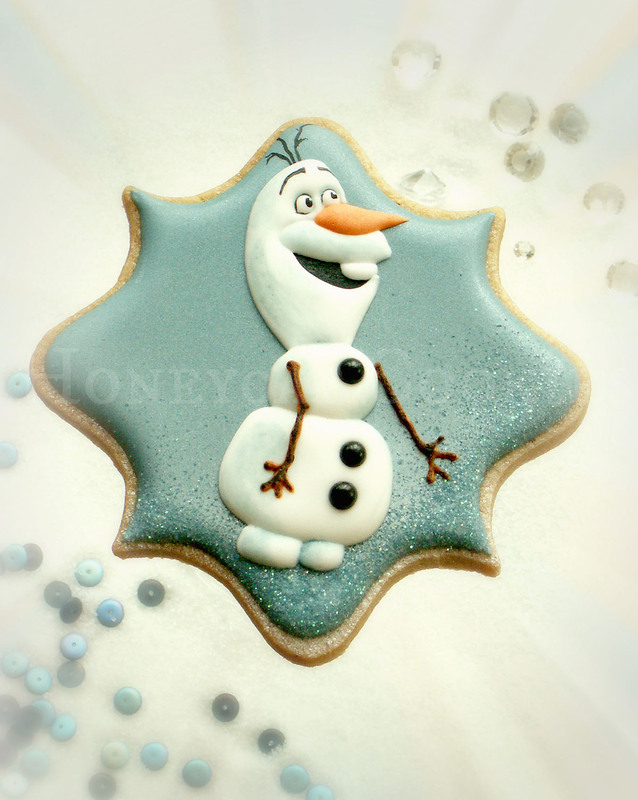 On the larger Olaf I also sprinkled some granulated sugar for sparkle. No I didn't, but when I dry cookies in the dehydrator they come out quite shiny, especially white icing with no colouring in. 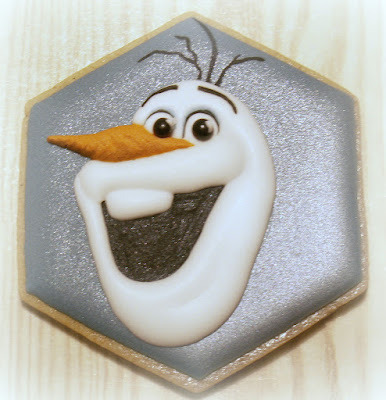 In the large Olaf I did paint a little bluish shadow onto him with gel colour, but it wasn't shimmery. What did you used for tracings the white lines??? I never seen a white marker!! Here we go - it was Lilaloa!